As coach for 12 years at Palo Verde High, her volleyball teams racked up numerous divisional and city championships along with four state runners-up. Kathy has been named Volleyball Coach of the Year four times and has served as chairwoman of the Southwestern Division and State Volleyball Coaches during which time she led the drive to get three levels of volleyball for girls, night games for the varsity and a 20-game schedule. A native resident of Tucson, Kathy is the recipient of the 1995-96 Arizona Christa McAuliffe Fellowship Grant and the TANDY Technology Award for Outstanding Science and Computer Teacher. She is a teacher of Marine Biology at Palo Verde. 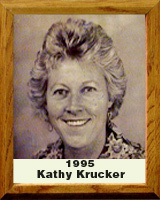 A 1995’s Women’s Sports Foundation Masters Sportswoman of the Year, Kathy was inducted into the University of Arizona Sports Hall of Fame in 1994.